Consider the case of an online book store. In addition to order information such as total amounts and items sold, the website owner also has detailed information about customers: their age, whether they have children, and their children's ages. The site owner wants to analyze the information about children's ages and use it for a retargeting list in a Yandex.Direct ad campaign. The site doesn't use its own customer ID system. 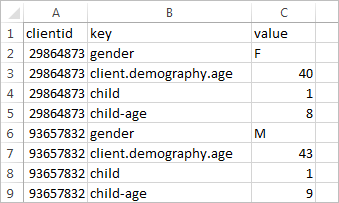 Since the age information is stored in a database, we need to form a CSV file in order to send this data to Yandex.Metrica. Since we aren't using our own ID system, we'll request the site user ID assigned by Yandex.Metrica. We use the getClientID method to make this request. XXXXXX is the tag ID. 12345 is a string value. We download the data and create a file with additional information about site users. Then we can upload the prepared file in the Yandex.Metrica interface, and get a report. The report shows that users have children ages 8-13. These are school-age children, so we can advertise school-related items before the beginning of the school year. To use the data we received in Yandex.Direct, we can create a segment with the appropriate user parameters in the Yandex.Metrica interface. Go to any report, such as Sources, summary. Choose the condition: Characteristics → User parameters. In Yandex.Direct, add a retargeting list. where XXXXXX is your tag ID.